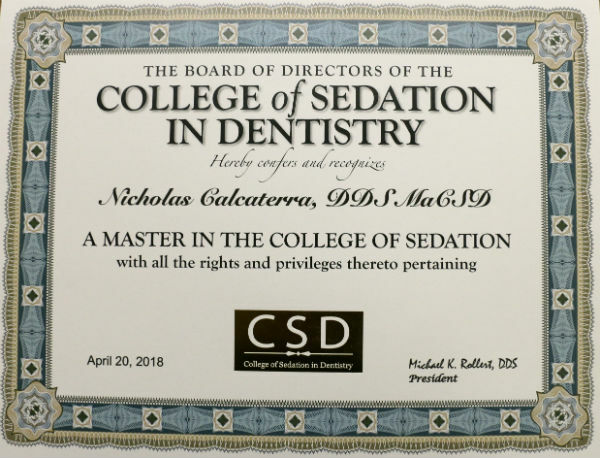 Dr. Nick Calcaterra recently sat for and passed the rigorous exam to become a Master in the College of Sedation in Dentistry. This makes Dr. Calcaterra the only general dentist in the entire State of Connecticut who has achieved this prestigious certification who is actively providing IV sedation. 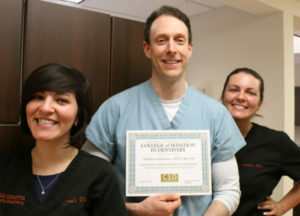 This accomplishment, along with being one of only a select few general dentists in all of Connecticut with a license to provide sedation, has made him the most accomplished sedation dentist in the entire state. What is the College of Sedation in Dentistry? The College of Sedation in Dentistry was created and is maintained by the American Dental Society of Anesthesiology. ADSA, as it is called, is the professional organization representing dental professionals who employ advanced forms of sedation and anesthesia to patients. The College of Sedation is designed primarily for general dentists and periodontists who wish to further their anesthesia skills. Achieving Master Status – which is the highest level a general dentist or periodontist can achieve – indicates that the provider has complete mastery of all the skills needed to perform IV sedation in his or her office. The rigorous prerequisites – along with a three hour board exam – make it extremely difficult for providers to achieve this status. 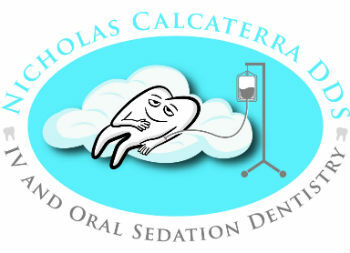 Why Sedation Dentistry with Dr. Nick Calcaterra? Dr. Nick Calcaterra’s vast experience and expertise in sedation for dental patients is what sets him apart. And becoming the only general dentist in Connecticut to be admitted as a Master is testament to his commitment and knowledge. Dr. Nick Calcaterra with his two Anesthesia assistants Cyndi and Amanda. Dr. Nick averages approximately 90 sedation cases per year, performing procedures such as extractions, root canals, and even simple fillings. For Dr. Calcaterra, sedations are an almost daily procedure. Most other sedation providers – assuming they even have a sedation license – average only one or two cases per month. Our vast experience in providing twilight anesthesia to patients – along with our caring staff – and Dr. Calcaterra’s deep expertise – are why Connecticut patients choose our office. 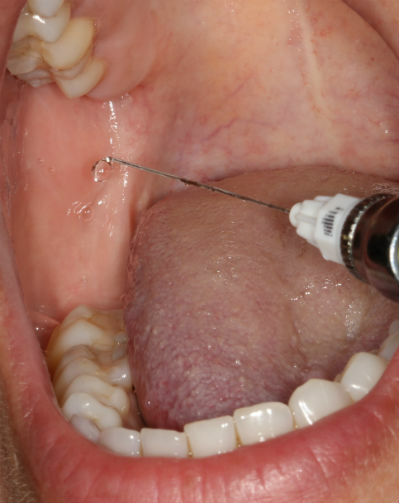 Are you interested in learning more about sedation dentistry? Then you’ve come to the right place! Go to this page to request a consultation or call us at (203) 799 – 2929. Dr. Nick and two assistants Cyndi and Amanda will be happy to help you. That’s right. Our video – Liz’s IV Sedation Wisdom Teeth Journey – has been viewed over one hundred thousand times on YouTube! And even more impressive, it racked up this number of views in only 18 months. In the video, you see Liz during her third molar extraction procedure – being sedated and having her teeth removed – and then hear her talk about it when we interview her several weeks later. What do you think? Did you watch all 6 minutes of it? We bet you did – along with over 110,000 other YouTube viewers! Great videography and editing by our multifunctional Dental Assistant Cyndi. Compassionate surgical and anesthesia skills exhibited by Dr. Nick in the video. A great patient – Liz – who remembers almost nothing of the procedure – but who was kind enough to allow us to document her surgical journey. It could also be due to her virtually painless healing period afterwards. Or the mango sherbet (go to the 3:55 point to see Liz as for it during the sedation). Want to be featured in one of our YouTube videos and become an overnight viral sensation? OK – we can’t guarantee that – but we can guarantee a great experience with one of Connecticut’s most experienced sedation dentists. Interested in learning more about IV sedation with Dr. Nick? Need your wisdom teeth removed and want twilight anesthesia? Call us at (203) 799 – 2929 or visit this page to request an appointment. This makes many people nervous. Fear of needles, often times referred to as trypanophobia, is a very common phobia. Fear of the dentist, also called odontophobia, is frequently seen in patients who are phobic of injections, needles, or other sharp objects. Then end result is a patient who is terrified of coming to the dentist. How do we overcome these fears, including needle phobia? With IV sedation. But, it doesn’t take a rocket scientist to notice the irony in the above statement. After all, how are you going to overcome a fear of needles by sticking a needle into a vein in someone’s arm? Think it’s impossible? Think again! Read on to learn how we do it. You will feel like you are floating in the clouds. No fear of needles up here! IV sedation, frequently called twilight sedation, as the name would imply, puts you into a twilight state. But what is a twilight state? A twilight state is a level of sedation in which you are very sleepy, your eyes are heavy, all your anxieties are gone, and you don’t care what’s going on. You may fall asleep. And you will likely have no memory of anything that occurred when you are in the twilight state. Our experience treating thousands of fearful patients is that for the majority of them – 99.9% – we can overcome trypanophobia and odontophobia – using IV sedation. If you’re floating in the clouds, your fears are long gone! Fear of needles is quite common. How common? Depending upon the source, approximately 20% to 22% of the population. In fact, there is even a diagnostic medical code for it (F40.231 for those interested). Needle phobias are associated with health care avoidance. The result is that patients delay/defer/postpone medical and dental treatment over this. Based on our experience, we then see patients coming in severe pain – pain that has lasted for months – because they avoided treatment due to trypanophobia and/or odontophobia. But phobic patients can get over their fears and get treatment done – under the right conditions. As stated earlier, we can get you over your needle phobia using twilight sedation. But if you’re afraid of the needle, how do you get an IV in? We give you a relaxing pill to take the morning before your appointment. This makes you super relaxed so by the time you arrive, half of your fear of needles is already gone. We begin to administer nitrous oxide. By itself, the nitrous makes you very relaxed. But combined with the relaxing pill, you won’t even feel us scanning your arm for veins. We place a little numbing agent (lidocaine to be exact) into the site. Next thing you know, the IV is in, and you didn’t even feel it. Nor did you care! At this point, we are all ready to begin. We begin the sedation, and all the fears dissipate. It’s that simple. Or you can view the video directly on YouTube or visit our amazing YouTube channel. We bet this video convinced you that we can overcome nearly any fear with sedation! Are you afraid of needles or the dentist? Interested in sedation? We are one of Connecticut’s most experienced sedation dentistry offices. Call us at (203) 799 – 2929 or visit this page to request an appointment.